These Californian plants of the Evening Primrose and Fuchsia order are among the prettiest of hardy annuals, robust, of easy culture, and flower for a long time. There are two species from which the numerous varieties now in cultivation have been obtained. C. elegans grows 2 feet high, erect, much branched, and bears long leafy racemes of flowers with undivided petals, varying from purple to pale red or a salmon color. The principal varieties of this species have double flowers, and two-Purple King (deep purple) and Salmon Queen (salmon-pink)-have flowers produced freely on strong branching plants, and are very effective border flowers. The other species, C. pulchella, varies in height from about 1 foot in the Tom Thumb sorts to 2 feet. It has magenta flowers normally, but there is every variation between deep purple and pure white, and there are also several double-flowered forms. Many varieties are mentioned in seed lists, some well worth growing. 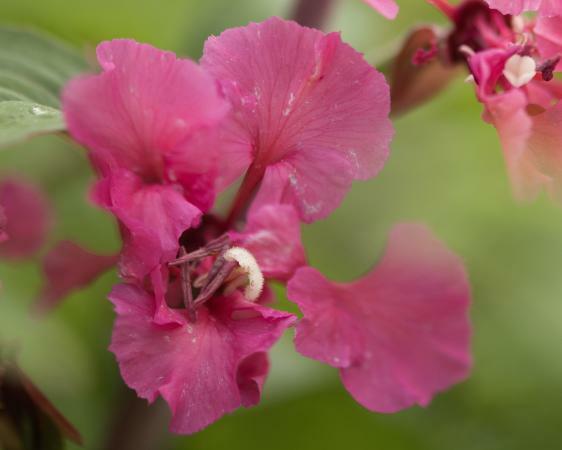 Clarkia may be sown either in autumn or spring, and by sowing in the beginning of September the seedlings gain strength before the winter, and flower well in early spring, but these autumn sowings are liable to accident, and should only be tried on warm soils. The first spring sowing should take place in the middle of March, when the plants would flower in July.